Inflammation of the outpouched part of the large intestinal wall, that is, inflammation of the diverticuli. I experience very severe pain. Is it due to diverticulitis? 69-year old smoker diagnosed with colon cancer. Does she need chemotherapy? 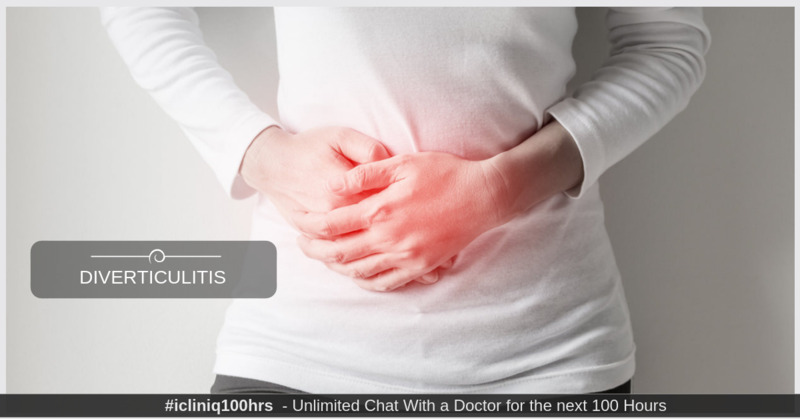 Does blood in stool occur due to diverticulitis? Less fiber in the diet. Few patients can be asymptomatic. These symptoms present according to the grade of severity. Treat diarrhea with an antidiarrheal drug if needed. Treat anemia by iron medication if hemoglobin is low. Antibiotics like Metronidazole and Cefixime or Ofloxacin (broad-spectrum coverage) can be beneficial. In complicated cases, surgery is needed. Do you have a question on Diverticulitis or Diverticula? I am passing blood in stool. Am I suffering from piles or some other problem? I have uneasiness in the left side of abdomen. What is the reason?